Is Beacon Technology the Missing Piece to Your Event? The best event organizers understand that integrating innovative technology into your planning is the best way to take your event to the next level. In addition to cutting-edge technology like mobile event apps, proximity beacon technology is quickly becoming an effective way to add more value, novelty, and enjoyment of your event. Beacon technology exploded onto the scene when Apple released their proximity sensing technology known as iBeacon. 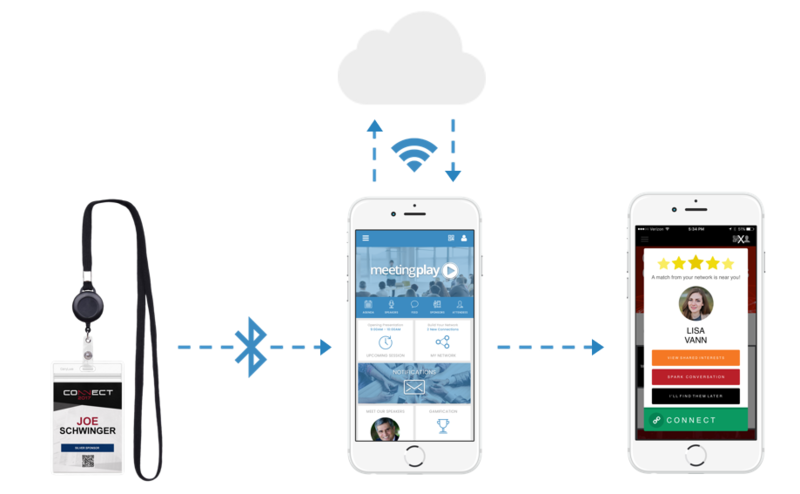 Proximity beacons use indoor Bluetooth combined with other mobile technology to pinpoint an app user’s location within a building, like your event venue. In general, beacon technologies come in two forms, installed and wearable, but work similarly to track your attendees and allow you to incorporate custom features into your event app in either case. The main difference between the two is, installed beacons aren’t mobile, so your users need to be near the beacons to use them. Wearable beacons, on the other hand, allow your users to access beacon-driven activities throughout your venue, as long as your attendee is wearing the beacon. As your attendees move, so do their beacon signals. Installed beacons are like Wi-Fi routers on a desk. You can access them when you’re nearby, but when you’re out of range, you lose the functionality. Using wearable beacons is like having a mobile Wi-Fi hotspot in your pocket. Wherever you go, you get to access the signal and use it to interact with mobile app features. There are times when installed beacons make more sense for your event, like for venue mapping, where installed beacons offer more accuracy and options. Because of the accuracy and variety of options for mobile event app integration, wearable beacons can transform your event and give you the best value for your investment. As such, we’ll focus on wearable beacons for the rest of this post. 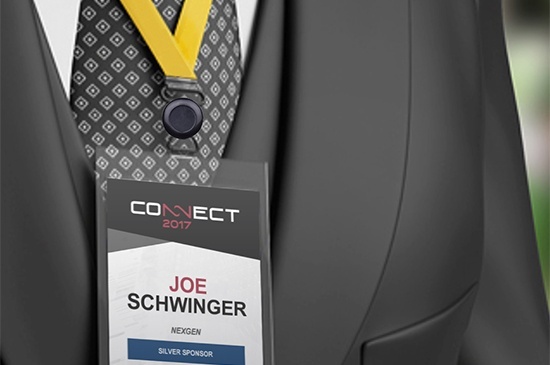 As their name suggests, wearable beacons are small proximity beacons that you can attach to your attendees’ lanyards. Wearable beacons broadcast Bluetooth LE signals through tiny built-in antennas. Smart devices within range receive the Bluetooth signals and transfer the Beacon ID to the cloud. The cloud can identify the user associated with the Beacon ID and transmit the information back to the smart device and respond with a notification or other action. Many of your attendees have one thing on their minds when they come to your event – networking. While your attendees understand the importance of networking, it can be difficult for many people to identify who they should meet and find common ground with potential connections. Wearable beacon technology is the perfect tool to help your attendees create meaningful connections and have fun doing it. For even more customization, your attendees can provide additional user information during the registration process or when they set up their profile. Assuming you’re using the right app provider, an algorithm can take the information and develop additional networking criteria and a list of networking connections for each attendee. Here are a few examples of what this allows you to do: provide mentors to newer employees, facilitate best practice sharing across regions, or introduce new team members following a reorganization. When your attendees arrive, they receive a lanyard with a wearable beacon attached to it. Their beacon emits a unique signal that contains their user profile information and can be used to interact with the mobile event app. Once you have your app and beacons in place, it’s time to have some fun. *Alerting your attendees when a match is nearby – Proximity beacons know your attendees’ positions in relation to one another. Using that data, you can push notifications through your event app to alert users when they are close to one of their matches. *Displaying user information and profile pictures on your users’ mobile devices – Your attendees don’t have to guess anymore about who to approach, and whether they are speaking to the right person. Pre-loaded profile information makes it easy for your attendees to find one another and make connections easily. *Providing conversation starters to facilitate easy and meaningful conversation – The days of fumbling for something to talk about are gone. Using proximity beacons and mobile event apps, you can provide your attendees with topics of interest to discuss based on their connection’s profile and pre-app survey. *Combining wearable beacons with gamification – Depending on your mobile event app provider, you can incorporate gamification features into your mobile event app to further enhance your attendees’ networking experiences. 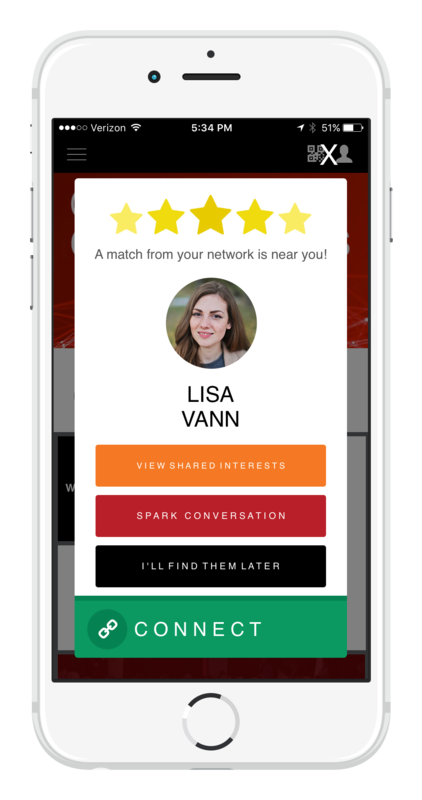 Using their app and proximity beacons, your users can gain points for connecting with other app users. Attendees are encouraged to approach strangers and make new connections, which creates a fun and rewarding environment for networking. Your attendees will be more comfortable connecting with others when you provide them with a relaxed setting that facilitates conversation. Read more about event gamification here. Using proximity beacons with your mobile event app makes networking fun for your attendees. No more awkwardness, uncertainty, and frustration. Your attendees will be amazed at how easily they can connect with other app users at your event. The transformational uses of wearable beacon technology go beyond networking. Wearable beacons can help you with event reporting by providing you with reliable data in real-time, and put a spotlight on areas that need additional attention. Beacon technology and mobile event apps can add exceptional value to your vendors and sponsors, much as they do for you and your attendees. Finally, combining beacon technology with your mobile event app allows you to give your attendees the convenience of GPS-like tracking inside your venue. At MeetingPlay, we’ve helped hundreds of clients effectively use beacon technology to achieve their event goals. For case studies and suggestions, contact us today or visit our website to learn more.